With Avnix New Forklift Loading Platform Attachment one man can quickly and safely load and unload awkward heavy equipment that is otherwise difficult to handle. Our Forklift Truck Platform Attachment is a platform attachment with a fold-up ramp intended for safe and efficient loading and unloading of materials and equipment with a forklift. 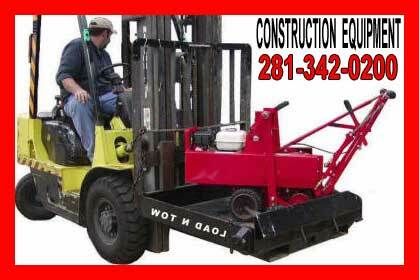 It is manufactured for use on any type forklift that has enough capacity to carry the load and has 48” long forks. Built into the design is a receiver that will take a standard 2” square trailer adapter and hitch for moving trailer mounted equipment around an construction site. Also built into the bottom of the platform is an attachment point for handling suspended loads. The platform is not designed for and should never be used to elevate personnel. Built-in receiver for moving trailer mounted equipment. Model 1397 – 42″ wide X 48″ deep – empty weight 305 lbs. Model 1398 – 48″ wide X 48″ deep – empty weight 355 lbs. Model 1391LD Raised Trailer Adapter and 2″ Chrome Ball – weight 10.5 lbs..
Model 1392 Trailer Adapter and Pintle Hitch – weight 24.5 lbs. Model 1393LD Trailer Adapter and Combo Hitch – weight 30 lbs. Installation: Install on fork truck by inserting both forks fully into the Lift & Carry pockets so that the rear of attachment is against the back of the fork. Wrap each safety chain around a strong part of the forklift carriage taking up all of the slack in the chain, then hook the chain back onto itself making sure the open part of the grab hook is pointing down. The chains should be hooked so that they have as straight a pull as possible. Nevertheless, the chain’s angles should never exceed 45 degrees. Both chains should be hooked to minimize any side movement of the lift attachment on the forks when towing equipment. Loading Platform The loading platform is used to load and unload all types of material and equipment. The front gate lowers to form a ramp making it easy to roll or slide equipment and materials on or off the platform. A spring-loaded latch located on the side secures the gate. Simply pull the T-Handle to release the gate. Be sure to keep feet and hands clear of the gate when it drops. The gate is designed so the it will stop at the correct loading angle. Always secure the gate in the “up position” when transporting a load. The load capacity of the deck is 6000 lbs. evenly distributed for all models. This capacity does not reflect the capacity of the forklift, which may be less. Refer to the load chart on the forklift for load capacities and remember to deduct the weight of the Load-N-Tow from those capacities. THE DECK IS NOT A PERSONNEL PLATFORM AND SHOULD NEVER BE USED TO ELEVATE PERSONNEL. Attachment Point for Suspended Loads: An attachment point (a round rod between to plates) is located on the underside of the Lift & Carry Attachment for picking suspended loads. It is rated at 4000 lbs. 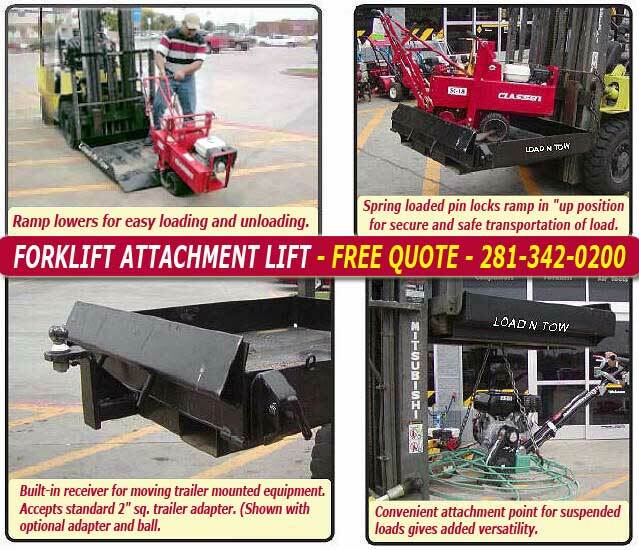 lift capacity and is located 24” from the back of the Lift & Carry forklift attachment. The 4000 lbs. rating is for the Lift & Carry attachment and does not reflect the capacity of the forklift. Furthermore, the weight of the Lift & Carry itself (shown on the product decal) must be deducted from the forklift capacity. The load on the suspended load attachment point should never exceed 4000 lbs. regardless of the capacity of the forklift. Restrain the load as necessary to prevent it from swinging. Trailer Adapter Receiver: A standard 2” sq. trailer adapter receiver can be found at the front of the Lift & Carry Attachment when the gate is raised. 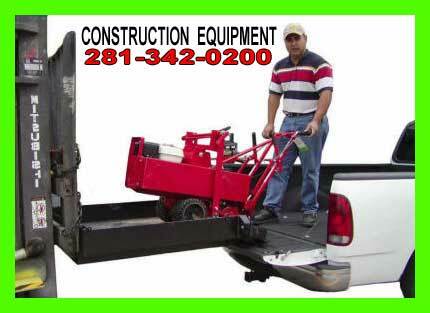 This is ideal for moving trailer mounted equipment around the yard. It can accept adapters with various hitch types to accommodate Ball or Pintle hitches. Because the gate must be raised to use the trailer hitch, it is best to use a raised type adapter that can be seen over the top of the gate. The adapter must be secured with the hitch pin and hairpin provided. Install the Load-N-Tow on the forks then raise it up to gain access to insert the hitch pin. The receiver is rated for a load capacity of up to 2,000 lbs. lift capacity however; the capacity of the trailer adapter and hitch also must be not be exceeded. Many trailer adapters/hitches are rated at less than 2,000 lbs lift capacity. Do not exceed their rating. General Safety Requirements: The forklift operator must be properly trained and have required certifications. When using the Lift & Carry Forklift Attachment always secure it to the forklift with the chains provided and keep forks level. When moving trailer mounted equipment or trailers also make sure the trailer adapter is secured to the Lift & Carry, and the hitch properly engaged. Also, be certain the forklift is capable of stopping the moving load. When lifting suspended loads with the hook point make sure, the lifting cables or straps are in good condition and properly secured to the Lift & Carry necessary precautions to prevent the load from swinging. When transporting equipment, make sure the gate is secured in the up position and the load is not top heavy and likely to tip. Refer to the forklift operator’s manual for proper operation and safety precautions for the forklift. Always observe all company, local, state, and federal Safety regulations. Decals should be replaced if found missing or illegible. Required decals include “Maximum Load Capacities and Caution” decal, “Empty Weight” decal and the Data Plate decal. Replacement decals are available from Star Industries at a nominal cost. Frequency of visual inspections should be based on individual usage patterns. We recommend that you perform inspections on the same basis as you inspect the forklift. Daily, weekly, etc. The forklift operator should do a visual inspection at the beginning of every shift looking for notable visible damage or missing parts.